Rudder fittings are one of the most critical elements of 505 rigging. From what I understand, this has always been the case, but the importance has been amplified over the last twenty years as the larger spinnaker was adopted and rudders have become longer and higher-aspect ratio, leading to increased loads on the fittings. The most common setup in the 505 is a fixed blade with the fittings mounted directly to the foil. Sound rudder fittings that are properly installed and aligned are not only critical to being fast, but they are also critical to safety. 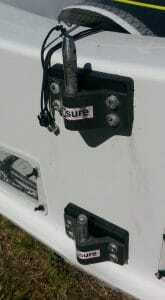 If you are out sailing alone and break your rudder fittings, you may have trouble getting back home safely. This article intends to inform the 505 community about what it takes to reduce or eliminate rudder fitting failure. I would venture to guess that 95% of rudder fitting failures in a 505 are caused by improper installation, improper hardware selection, or lack of preventative maintenance. The other 5% of failures are caused by running aground or hitting a submerged subject. Bottom line; rudder fitting failure can, for the most part, be avoided. Misaligned fittings that are not in column with one-another cause accelerated wear of the fittings with every movement of the blade. The transom should be flat and square and fittings should be precisely measured to be square with the boat and with each other. Fittings installed into loose screw holes or with fasteners not properly torqued can cause movement of the fittings and lead to catastrophic failure. Many top teams mount their hardware in the blade and transom using a mixture of epoxy and filler (wax or McLube the screws before installation so you can remove them). 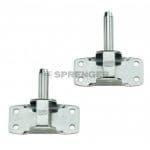 This creates the effect that the machine screws are tapped through the entire bore and eliminates any chance of movement. The best installation on anything other than a new virgin hull is as follows: locate the transom fittings, drill 1/2″ holes, fill with epoxy/high density filler flush with both surfaces. When dry, relocate accurately, drill proper size holes, install with silicone sealer or epoxy/filler mixture (again, remember to wax or McLube screws). 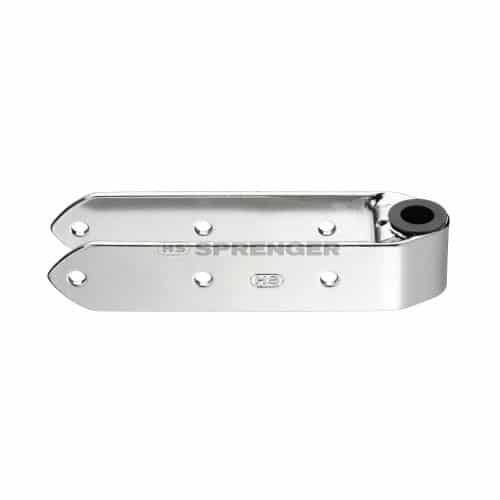 There are many types of rudder fittings available (see subsequent section), but the most common is the 8mm Sea Sure aluminum fittings which are manufactured in the United Kingdom. Most rudders are 25mm or about 1” wide at the head; this leads to most people selecting the 1” Sea Sure fittings. However, the most common failure in properly installed setups involves the 1” Sea Sure bottom rudder fitting failing at the apex (see photo below). 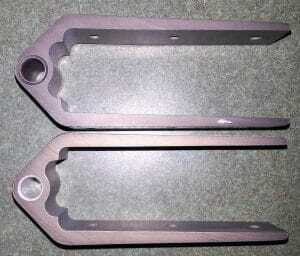 It is important to note that the bottom set of rudder fittings is under higher load than the top fittings. As a result, the bottom fittings are usually the first to wear and the first to fail. Using the 1.5” bottom fitting with two ¼” or 6.3mm packing shims is the preferred installation, as the geometry is such that the aluminum is subject to less shear stress when compared to the 1” fitting. The 8mm Sea Sure hardware has been used extensively in the 505 class throughout the last 30 years. That said, there has been a trend toward larger hardware to allow for more forgiveness as it relates to wear and poor installation. 10mm hardware has a little more margin for error than the historically standard 8mm parts. More on this later. If you can feel any slop or play in the rudder fittings while sailing, the gudgeons should be replaced. 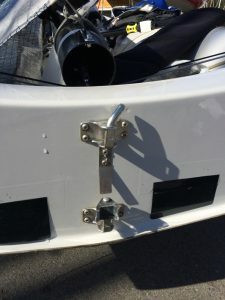 Excessive fitting wear will create shock loads from the rudder shifting sides, which will cause the lower fitting to move and that will break the hardware or foil. Check for movement on the side of the lower transom fitting – a vertical line on the transom very close to the fitting indicates that it has moved, and how much. If a pintle is bent or loose relative to the mounting base, then it should be replaced. On the Sea Sure pintles, the pin coming loose from the aluminum base or breaking at the set-screw location is fairly common. Make sure you inspect carefully after each day on the water. There are many options out there for rudder fitting hardware. This section describes some of the common setups that have been proven to work in the 505 class. If you have a setup that you would like to have considered for addition to this article, please email [email protected]. The most common arrangement is to have both pintles on the transom and both gudgeons on the blade, although there is no reason you cannot mix one-and-one. The mixed setup seems to have been more common in the 1980’s and 1990’s. The nylon bushing version of the 8mm gudgeons do not seem to be sufficient for the lower fitting on a 505. The non-bushing version mates the aluminum directly against the stainless pintle and is capable of withstanding higher loads without deformation. Some teams glue the bottom fitting to the transom (filling the void behind the pintles) with epoxy and high density filler (see picture) to reduce the likelihood of movement. The transom would need to be sanded sufficiently for the glue to adhere. Theoretically, this should help although I do not have experience with doing so. Mike Holt is the guy to ask about this approach. There is a shorter top (Part # 38794 002 55) and longer bottom (Part # 38794 001 55) pintle offered; using the long on the bottom makes putting-on and taking-off the rudder much easier. This is actually true for any manufacturer’s parts, but it is more obvious with the Sea Sure fittings due to the different number of mounting holes. The HS Sprenger gudgeons are very strong but heavy. Only recently have the gudgeons been adopted for use in the 505 class. Many teams use a mix of Sea Sure gudgeons with the HS Sprenger pintles. The newly released 10mm Sea Sure gudgeons with carbon insert fit quite nicely on the HS Sprenger pintles and seem to last quite well without wear or deformation. 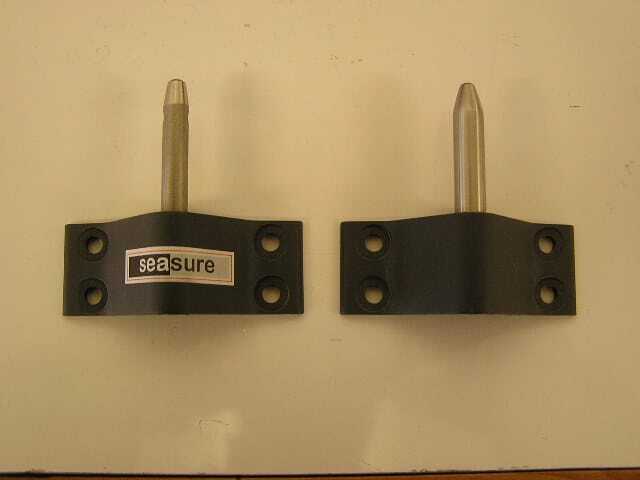 Before the release of the 10mm Sea Sure parts, many teams would machine out the 8mm fittings to 10mm. Note: this has to be done with a reamer and a milling machine to get the proper tolerance; if you use a drill press/hand drill and conventional drill bit it will result in a poor fit which could lead to accelerated wear and failure. Waterat supplies the Sea Sure fittings machined out to match the bore of your choice, see below. Apparently, Mike Martin has cracked one of the HS Sprenger pintles, but perhaps he is out practicing when the rest of us are too scared to sail? 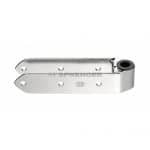 For all Sea Sure bottom (4 hole) transom fittings, Waterat recommends using #12 hardware. 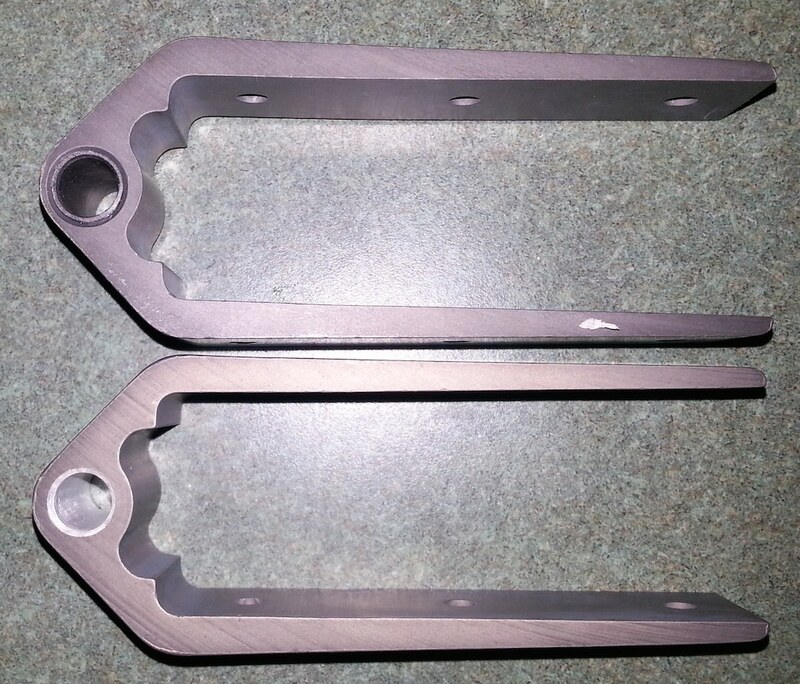 The 10mm parts use the exact same aluminum extrusions as the 8mm parts, but just use a larger bore and pin size. This results in less material between the wall of the hinge bore and the outside of the fitting; this has not proven to be a failure mode but is worth consideration. The rule of always using the 1.5” wide bottom rudder fitting still applies to the 10mm parts. 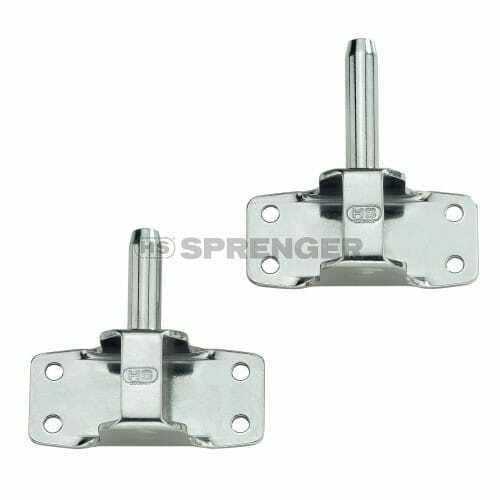 In this case, the 1.5” wide, 3 hole bottom rudder gudgeon is Part # SS2206B. The gudgeons are only offered with a carbon reinforced plastic bushing, designated by the “B” at the end of the part #. Unlike the 8mm counterpart, the 10mm bushings appear to be higher quality (unconfirmed as to whether the material is actually different) and last longer. The longevity is likely also improved by the larger pin size resulting in a lower stress concentration when fully loaded. For the inventive types out there who have access to a machine shop, there are some other options that may be worth considering. One example is the Mike Martin setup which uses gudgeons on both the boat and the rudder with a custom 8mm titanium pin that is inserted through both the top and the bottom (see photo above). 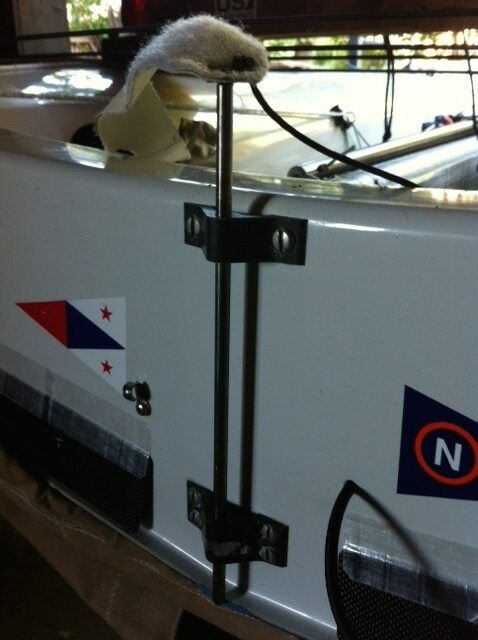 The pin is inserted through a hole in the tiller which allows for the tiller to stay attached to the rudder at all times. While this setup is light and very strong, consider the difficulty in putting on and taking off the rudder when in unprotected areas (i.e. beach launch in 25 knots). The buoyancy of the rudder makes it difficult to align both top and bottom fittings while you insert the pin, but once the blade is on, this setup should be very strong. Note that Mike is using the Ronstan rudder gudgeons and has had good luck with the bushings holding up to the abuse of the 505 application. I believe the Ronstan fittings are cast whereas the Sea Sure Fittings are extruded then machined; in theory, the later will result in a stronger part but this difference does not appear to be an issue. The initial drilling and mounting of the rudder is critical; you do not want to drill additional holes in the rudder head during subsequent installations, as you effectively create a perforation for the rudder to break along. This is especially true on the lower fitting where the blade has its highest stress concentration. The rudder itself is under high torsional load; inspect the rudder often for cracking of the laminate. Horizontal cracking near the waterline or vertical cracking along the front of the blade is especially concerning and could indicate laminate failure. Mounting the rudder so that it is properly aligned with the boat and CB case is critical; this process involves a lot of measuring prior to getting the drill out. One trick is to hang the boat securely so the CB can be lowered as well as the rudder hung; this allows for a visual check as well as additional measurement. Make sure the tiller is installed and can clear the seat tanks prior to drilling any holes. Do not try to adjust the fore & aft rake angle of the rudder by the fitting placement; the fittings should be fully seated on the front edge of the rudder head. 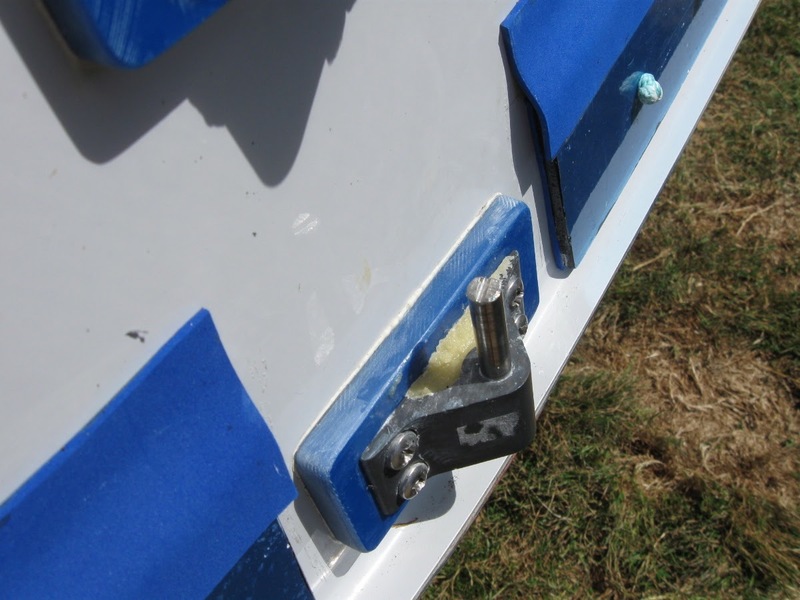 No matter what hardware you select, it is critical to have a properly installed and maintained rudder fitting setup before you hit the water. Consider having an entire set of spares with you in your toolbox when traveling to a major regatta; don’t count on your fellow sailors to part with their valuable spares. Rudder fittings are a project that is best completed at home when you have time to do the job correctly. Usually, a rushed job results in a poor end product and repeat failures. As with any boat project, doing it right the first time is the best approach.